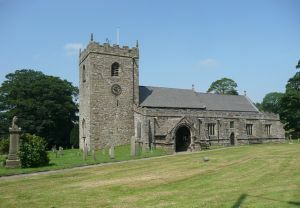 The medieval church of St Mary's at Gisburn has a long and interesting history. Let's start with the name; the church was originally dedicated jointly to St Mary the Virgin and St Andrew. At a time when the north of England was subject to frequent raids from Scottish marauders, it was considered a sensible precaution to dedicate the church to the patron saint of Scotland, in the hopes that the Scots would be swayed to spare it from their attentions. A more practical reason for the joint dedication was that the patronage of Gisburn was shared jointly by the Archbishop of York and Stainfield nunnery in Lincolnshire, which was jointly dedicated to St Mary and St Andrew. The church must date to at least the early 12th century, as records show a rector from Gisburn present at the dedication of Sawley Abbey in 1147. The abbey and church had a rocky relationship; the abbot of Sawley unsuccessfully claimed the patronage of Gisburn, and in 1285 he accused the vicar of Gisburn of taking game from the abbey warren. Gisburn enters history more prominently in the 17th century. In 1612 a native of the village, Jennet Preston, was accused of witchcraft as one of the so-called Pendle Witches. She was found guilty and hung at York a few weeks before the trial of the other Pendle Witches at Lancaster. It is thought that the large memorial in the churchyard showing a witch and cauldron is to her memory. During the Civil War Oliver Cromwell stayed in the village for at least one night. His troopers used St Mary's to stable their horses, and in typical Parliamentarian fashion, broke the stained glass windows in the church. The church is entered through a 13th-century south doorway, protected by a 15th-century porch. The interior of the church is dominated by a pair of Romanesque arches which may have come from Sawley Abbey and a Norman tower arch. Parts of the screen date to 1500, but it has had much remodelling and additions. There are four funerary hatchments on display to members of the Ribblesdale family. The Ribblesdale family vault is entered by a separate doorway in the north wall of the church and contains memorials from the early 19th century onwards.